For other uses, see Auld Lang Syne (disambiguation). Frank C. Stanley's 1910 performance of Auld Lang Syne. Contains the first and last verse. "Auld Lang Syne" (Scots pronunciation: [ˈɔːl(d) lɑŋˈsəin]: note "s" rather than "z") is a Scots poem written by Robert Burns in 1788 and set to the tune of a traditional folk song (Roud # 6294). It is well known in many countries, especially in the English-speaking world, its traditional use being to bid farewell to the old year at the stroke of midnight. By extension, it is also sung at funerals, graduations and as a farewell or ending to other occasions. The international Boy Scout youth movement, in many countries, uses it to close jamborees and other functions. The song's Scots title may be translated into standard English as "old long since", or more idiomatically, "long long ago", "days gone by" or "old times". Consequently, "For auld lang syne", as it appears in the first line of the chorus, might be loosely translated as "for (the sake of) old times". 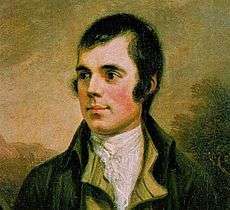 Robert Burns sent a copy of the original song to the Scots Musical Museum with the remark, "The following song, an old song, of the olden times, and which has never been in print, nor even in manuscript until I took it down from an old man." Some of the lyrics were indeed "collected" rather than composed by the poet; the ballad "Old Long Syne" printed in 1711 by James Watson shows considerable similarity in the first verse and the chorus to Burns' later poem, and is almost certainly derived from the same "old song". It is a fair supposition to attribute the rest of the poem to Burns himself. Singing the song on Hogmanay or New Year's Eve very quickly became a Scots custom that soon spread to other parts of the British Isles. As Scots (not to mention English, Welsh and Irish people) emigrated around the world, they took the song with them. A manuscript of "Auld Lang Syne" is held in the permanent collection of The Lilly Library at Indiana University in Bloomington, Indiana. The song begins by posing a rhetorical question as to whether it is right that old times be forgotten, and is generally interpreted as a call to remember long-standing friendships. 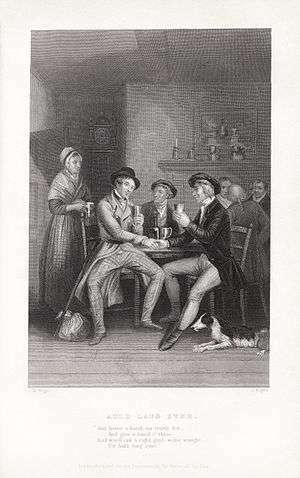 Thomson's Select Songs of Scotland was published in 1799 in which the second verse about greeting and toasting was moved to its present position at the end. Most common use of the song involves only the first verse and the chorus. The last lines of both of these are often sung with the extra words "For the sake of" or "And days of", rather than Burns' simpler lines. This allows one note for each word, rather than the slight melisma required to fit Burns' original words to the melody. And surely ye'll be your pint-stoup! And give me a hand o' thine! an nivir brocht‡ ti mynd? † dine = "dinner time"
* syne = "since" or "then" – pronounced like "sign" rather than "zine". The tune to which "Auld Lang Syne" is commonly sung is a pentatonic Scots folk melody, probably originally a sprightly dance in a much quicker tempo. In 1855, different words were written for the Auld Lang Syne tune by Albert Laighton and titled, "Song of the Old Folks." This song was included in the tunebook, Father Kemp's Old Folks Concert Tunes published in Boston, Massachusetts in 1860. For many years it was the tradition of the Stoughton Musical Society to sing this version in memory of those who had died that year. Songwriter George M. Cohan quotes the first line of the "Auld Lang Syne" melody in the second to last line of the chorus of You're a Grand Old Flag. It is plain from the lyrics that this is deliberate. John Philip Sousa quotes the melody in the Trio section of his 1924 march "Ancient and Honorable Artillery Company"
In the Sacred Harp choral tradition, an arrangement of it exists under the name "Plenary". The lyrics are a memento mori and begin with the words "Hark! from the tomb a doleful sound". Another Christian setting, using the name "Fair Haven" for the same tune, uses the text "Hail! Sweetest, Dearest Tie That Binds" by Amos Sutton. The University of Virginia's alma mater ("The Good Old Song") is also sung to the tune of "Auld Lang Syne". "Auld Lang Syne" is traditionally sung at the conclusion of New Year gatherings in Scotland and around the world, especially in English-speaking countries. At Hogmanay in Scotland, it is common practice that everyone joins hands with the person next to them to form a great circle around the dance floor. At the beginning of the last verse, everyone crosses their arms across their breast, so that the right hand reaches out to the neighbour on the left and vice versa. When the tune ends, everyone rushes to the middle, while still holding hands. When the circle is re-established, everyone turns under the arms to end up facing outwards with hands still joined. In countries other than Scotland the hands are often crossed from the beginning of the song at variance with Scottish custom. The Scottish practice was demonstrated by the Queen at the Millennium Dome celebrations for the year 2000. The English press berated her for not "properly" crossing her arms, unaware that she was correctly following the Scottish tradition. As well as celebrating the New Year, "Auld Lang Syne" is very widely used to symbolise other "endings/new beginnings" – including farewells, funerals (and other memorials of the dead), graduations, the end of a (non-New Year) party or a Boy Scout gathering, the election of a new government, the last lowering of the Union Jack as a British colony achieves independence and even as a signal that a retail store is about to close for the day. The melody is also widely used for other words, especially hymns, the songs of sporting and other clubs, and even national anthems. In Scotland and other parts of Britain, in particular, it is associated with celebrations and memorials of Robert Burns. The following list of specific uses is far from comprehensive. In Scotland, it is often sung at the end of a céilidh or a dance. The tune is played, and sung by the crowd, in the final stages of the annual Edinburgh Military Tattoo. In many Burns Clubs, it is sung at the end of the Burns supper. In Great Britain, it is played at the close of the annual Congress (conference) of the Trades Union Congress. The song is sung at the end of the Last Night of the Proms by the audience (rather than the performers) and so it is not often listed on the official programme. The song is played at the Passing Out Parade of Young Officers in the Royal Navy as they march up the steps of the Britannia Royal Naval College; and at the Sovereign's Parade at the Royal Military Academy Sandhurst for young officers joining the British Army, as the cadets march up the steps of their famous Old College building – to the beat of the slow march, after the tune "Will ye no come back?". This custom (or something very like it) is also followed in Naval and Military colleges in many other countries, especially members and former members of the Commonwealth of Nations. Examples include the Royal Military College of Canada, the Royal Military College (Malaysia), the National Defence Academy (India), the Indian Military Academy, the Officers Training Academy (India), the Pakistan Military Academy, Bangladesh Military Academy and at the equivalent colleges in Singapore, Burma and Nigeria. Since 2007, the melody has been used as an introduction to the mass chorus of "America the Beautiful" that is played by the twelve finalist corps at the Finals Retreat at the Drum Corps International World Championships. Coincidentally, "Auld Lang Syne" and "America the Beautiful" have the same metre, and the lyrics can be sung interchangeably. Auld Lang Syne has been translated into many languages, and the song is widely sung all over the world. The song's pentatonic scale matches scales used in Korea, Japan, India, China and other East Asian countries, which has facilitated its "nationalisation" in the East. The following particular examples mostly detail things that are special or unusual about the use of the song in a particular country. In India and Bangladesh, the melody was the direct inspiration for the popular Bengali folk song  "Purano shei diner kotha" (Memories of the Good Old Days) composed by Nobel laureate Rabindranath Tagore, and forms one of the more recognisable tunes in Rabindra Sangeet (Rabindra's Songs), a body of work of 2,230 songs and lyrical poems that form the backbone of Bengali music. In Denmark, the song was translated in 1927 by the famous Danish poet Jeppe Aakjær. Much like Robert Burns' use of dialect, Aakjær translated the song into the Danish dialect sallingbomål, a dialect from the northern part of western Jutland, south of the Limfjord, often hard for other Danes to understand. The song "Skuld gammel venskab rejn forgo", is an integral part of the Danish Højskole tradition, and often associated with more rural areas and old traditions. Also, the former Danish rock group Gasolin modernised the melody in 1974 with their pop ballad Stakkels Jim ("Poor Jim"). Before 1972, it was the tune for the Gaumii salaam anthem of The Maldives (with the current words). In the Netherlands, the melody is best known as the Dutch football song "Wij houden van Oranje" (We love Orange) performed by André Hazes. In Thailand, the song "Samakkhi Chumnum" ("สามัคคีชุมนุม", "Together in unity"), which is set to the familiar melody, is sung after sporting fixtures, and at the end of Boy Scout jamborees, as well as for the New Year. The Thai lyrics are about the King and national unity, and many Thais are not aware of the song's "Western" origin. In Japan, although the original song is not unknown, people usually associate the melody with Hotaru no Hikari, which sets completely different lyrics to the familiar tune. Hotaru no Hikari is played at some school graduation ceremonies, and at the end of the popular New Year's Eve show NHK Kōhaku Uta Gassen. It is played as background music in various establishments such as bars, restaurants, or department stores in Japan to let the customers know that the establishment is closing soon. In South Korea, the song is known as Jakpyeol (작별 / Farewell) or (less commonly) as Seokbyeol I Jeong (석별의 정 / The Affection of Farewell). From 1919 to 1948, it was also the melody of Korea's national anthem. The lyrics were the same as today's South Korean anthem. Syngman Rhee commissioned Ahn Eak-tai to write the melody currently used for the anthem in 1948. The strong and obvious associations of the song and its melody have made it a common staple for film soundtracks from the very early days of "talking" pictures to the present—hundreds of films and television series' episodes have used it for background, generally but by no means exclusively to evoke the New Year. 1980: Dan Fogelberg reprises the melody at the end of his hit song, "Same Old Lang Syne"
↑ Susan Rennie (ed.). "Lang Syne". Dictionary of the Scots Language. Dsl.ac.uk. Archived from the original on 19 January 2012. Retrieved 2012-01-01. ↑ "Robert Burns - Auld Lang Syne". BBC. 23 April 2009. Retrieved 2012-01-01. 1 2 "The History and Words of Auld Lang Syne". Scotland.org. Retrieved 2012-01-01. 1 2 "nls.uk". nls.uk. Archived from the original on 2013-11-11. Retrieved 2012-01-01. 1 2 Lindsay, Maurice (December 1996) . "Auld Lang Syne". The Burns Encyclopedia (New Third ed.). Robert Hale Ltd. ISBN 0-7090-5719-9. Retrieved 28 December 2007. ↑ Traditional (2006). "Auld Lang Syne". Traditional Songs from Scotland. Ukmagic.co.uk. Retrieved 2012-01-01. ↑ "The Lilly Library, Guide to the Collections: British Literature". Indiana.edu. 9 December 2011. Retrieved 2012-01-01. 1 2 3 "Electric Scotland history site". Electricscotland.com. Retrieved 2012-01-01. ↑ Wilson, James (Sir) (1923) The dialect of Robert Burns as spoken in central Ayrshire, Oxford University Press. ↑ Scholes, Percy A. The Oxford Companion to Music, Tenth Edition. Oxford University Press. ↑ "Father Kemp and Auld Lang Syne". Americanmusicpreservation.com. Retrieved 2012-01-01. ↑ "Hail! Sweetest, Dearest Tie That Binds;". Hymntime.com. Archived from the original on 11 January 2012. Retrieved 2012-01-01. ↑ Logan, James (1831). The Scottish Gaël; Or, Celtic Manners, as Preserved Among the Highlanders: Being an Historical and Descriptive Account of the Inhabitants, Antiquities, and National Peculiarities of Scotland : More Particularly of the Northern, Or Gäelic Parts of the Country, where the Singular Habits of the Aboriginal Celts are Most Tenaciously Retained. 2. Smith Elder. p. 253. Retrieved December 30, 2015. ↑ Aslet, Clive (13 July 2007). "One doesn't do tantrums and tiaras – Telegraph". London: Telegraph.co.uk. Retrieved 25 November 2008. ↑ "Queen stays at arm's length". Archive.thisislancashire.co.uk. Retrieved 10 December 2010. ↑ National Defence Academy Retrieved 8 February 2012. ↑ "Bengali Traditional Folk Music - Various Artists - Songs, Reviews, Credits - AllMusic". ↑ "Archived copy". Archived from the original on 25 March 2015. Retrieved 2015-04-04. ↑ "'The Governor's Last Farewell'". BBC News. 1997. Retrieved 29 December 2013. ↑ "'New record' for Auld Lang Syne". BBC News. 30 November 2009. Retrieved 25 April 2010. ↑ "Lee Kuan Yew: A very Singaporean send-off". BBC News. 29 March 2015. Retrieved 3 December 2016. McKellar, Kenneth. "Auld Lang Syne (in Scots)" (MP3). Retrieved 28 December 2007. Multiple versions and tunes at The Mudcat Cafe's "Digital Traditions"